Full disclosure: I am a complete novice to fairycraft. My only experiences have been through the stray YouTube video about fairy rings and doors, Starhawk’s hush-hush treatment of her coven’s fairycraft in her book, and then what I’ve gleaned from popular culture. Even though I knew very little when I set out to read this book, I was so completely excited to get my hands on it. When something has been shrouded in so much secrecy, it’s easy to build up in your mind. But I’m really happy to say that Daimler’s book did not disappoint. Not only that, but I actually felt as if I learned a few things, too. When a neopagan witch chooses to follow the Fairy Faith and blends the two together, the result is a new system, which I am calling Fairy Witchcraft, that uses elements of the beliefs and practices of both to create a whole. It is a way not just to honor the fairies, but also to connect to them and to the Otherworld on a deeper level. 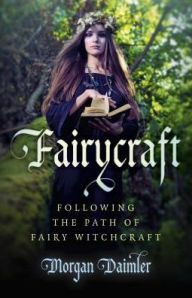 From the well-researched and informative introduction, she breaks up her exploration of fairycraft into typical categories that you’d find in a neo-pagan book, like chapters on stone/plants/animals, holidays and feasts, prayers, dreaming and meditation, and a last chapter on daily practice. The first four chapters are devoted to the history of fairies (which she draws from mostly Irish sources) and these were the sections I found most interesting. This is an academic book in many ways. It hasn’t been peer-reviewed (to my knowledge), but Daimler tackles her work with the precision of an expert, and her writing shows it. The sentences are clear and easy to follow, and she has a multitude of sources to back her work up. What appealed to me the most about this book was the fact that she had citations. Perhaps it’s the academic in me coming out, but whenever I see citations in books like this, I get very excited. Citations are the evidence that someone is building on someone else’s knowledge, which — if traced all the way through the works cited and bibliography — means there’s a genealogy of knowledge to follow, which means there’s an original source. A citation is an artifact — like a fairy ring itself — that something has come before us, and if we follow the right clues, we can have access to all this hidden knowledge. Citations also offer a map to something that used to be passed around through oral culture, and in so many ways, citations are a bit of magic to me. When I was reading the introduction, and Daimler took time out to break down the etymological history of the words witch and fairy, I knew I was going to like this book. Etymology is the tracing of how a word has come into formation, and what it means, and how its changed. I’m an English Lit nerd who loves knowing this kind of stuff — but I also do think there’s a hint of magic when you start to really dive deep into language. If we can bring things to fruition by uttering a spell to make it so, then we need to know about our language. By breaking these words down, not only does Daimler provide an alternative history and a new way of looking at the terms she uses, she also locates herself in this history and allows her audience to do the same. This book isn’t light reading — but I don’t want people to think it’s too academic, since often times those texts can be stale and dry. The citations add a touch of reality to the work, which gives the magic more validity. So many people try to dismiss this lore as nothing but imaginations run wild — but there have been legends about fairies for hundreds of years. There have been records and stories passed down, which Daimler recounts in detail. Sure, there have been hoaxes, too (like the Cottingley Fairies), but even hoaxes have something to teach us about the craft itself. Daimler doesn’t shy away from talking about all aspects of fairycraft, including the misconceptions and negative aspects, and I’m always much more willing to pay attention to an author who has some humility about their topic. Anyone who is trying to convince me that something is real, without discussing anything negative, is a salesperson. I want to talk to someone real, and Daimler’s tone in her book was real, genuine, and humble. I appreciated that, and for that reason — and the citations themselves — I would recommend this book to people.